The book/workbook True Ghost Stories That Teach is a collection of eerie, scary, odd or even funny tales that are possibly true or inspired by true events. These very interesting stories are based on historical happenings (Underground Railroad, Pearl Harbor, Revolutionary War, Ellis Island and many more) with connections to other content areas such as language arts (vocabulary, grammar, reading comprehension, discussion, and writing practice), math, geometry, geology, drama, geography, art, science, health and more; all with the aim to tie in or review all subjects in a fun and relevant way. The stories themselves are written so that the reader feels involved, eager, and even compelled to read more. The following exercises are varied from simple true/false statements, fill in the blank, unscrambling, crossword puzzles, sequencing, map and timeline filling out, drawing, matching, discussion prompts, paragraph or simple essay writing and more. 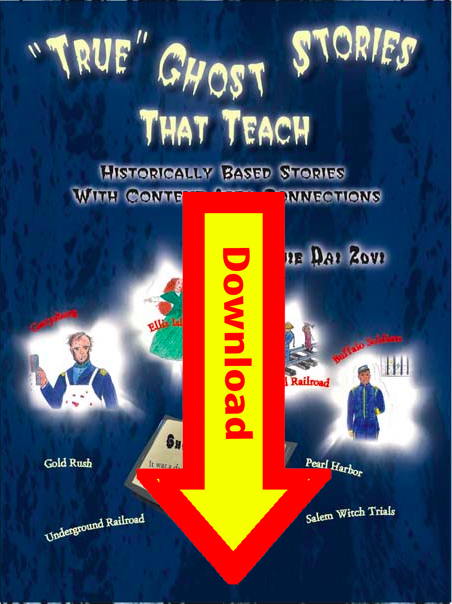 True Ghost Stories That Teachare geared for students reading on a 4th-5th-grade level, so they are appropriate for regular education, special education, ESL, and adult learners. These stories are a great way to enliven and enhance U.S History units in elementary, middle or even High School classes. True Ghost Stories That Teach can even be used in American Citizenship classes or general Basic Education classes. Any person, student of not, should rea True Ghost Stories That Teach. The stories are so good that they make great reading for ghost lovers of all ages. Volume discounts are available for schools needing workbooks for each student. Also available is the True Ghost Stories That Teach ...Out Loud CD for great listening practice.